With all of the snow, it was a good day to launch the Christmas Cheer Board grocery bag campaign on Tuesday in Winnipeg. 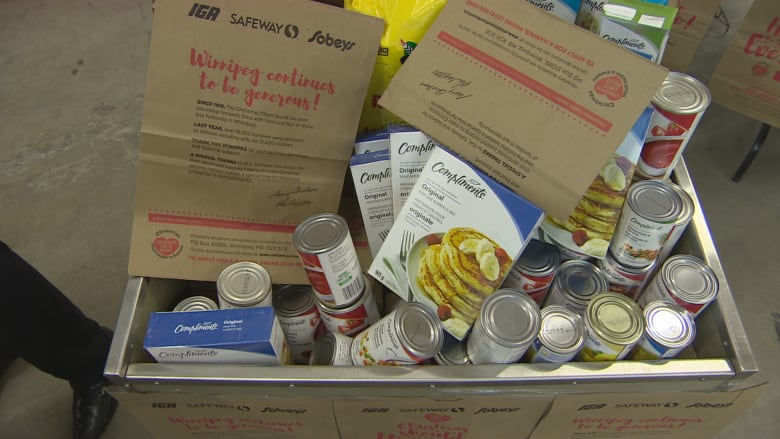 The campaign has people fill up a grocery bag at the nearest IGA, Safeway or Sobeys which are then used to fill Christmas hampers for families in need during the holiday season. "Christmas is stressful for all of us but if you don't have a lot it becomes even more stressful," said Kai Madsen, executive director of the Christmas Cheer Board. "Not only does this hamper provide a nice Christmas dinner with turkey and gifts for the kids and so on, but in many cases I suspect it also reduces the stress level a little bit." The brown paper bags will be delivered to 53,000 homes with a list on the front of the organization's most needed items. "Fill the bag and then there is a nice convenient box or bin at the front of the store and then after you paid for the products put them in the bin," Madsen said. The Christmas Cheer Board has been creating hampers for families in need since 1919. There are more than 4,000 volunteers who make sure that the hampers get packed and delivered to around 18,500 homes. "Winnipeggers are not only great at volunteering but they are also extremely generous," Madsen said. The Cheer Board collects close to $2 million in cash and groceries to meet their annual goal.